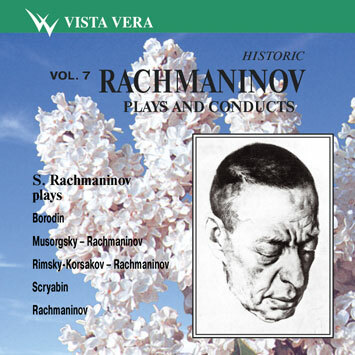 Especially valuable in this respect is Volume 7 in which, apart from the single and superb playing of Scriabin's Prelude Op.11 No.8 we hear essentially all-Rachmaninov and some of the Preludes and Etude- tableaux in particular. The rapt and starkly romantic Melodie Op.3 No.3 is an object lesson in narrative tension (he plays the revision) - a quite wonderful performance by the way full of myriad subtleties - and the famous Polka de V.R. shows how nudge-nudge playing, beloved of some, is no substitute for the finesse, control and a kind of aristocratic aloofness that the composer displays here. Throughout these recordings voicings, colour, depth of lyricism and digital command are all harnessed to optimum effect. Declamatory and leonine power flow throughout the Prelude Op.32 No.3 but really it's invidious to single out any particular performance.